In 2001, Cary Carbonaro and her then-husband were on their way to buy a new car when he told her, “I can’t put the car in my name because of my credit.” Carbonaro was confused. The newlyweds were living in New York, and she was under the impression he was well-off financially — certainly not the kind of person who’d have trouble getting an auto loan. Carbonaro and her husband divorced in 2008. Carbonaro’s was a rather extreme case of what she calls “financial infidelity”: lying to your partner about your financial situation. Her husband was an attorney and CPA who thought only “suckers” pay back their loans and concocted schemes to avoid his. 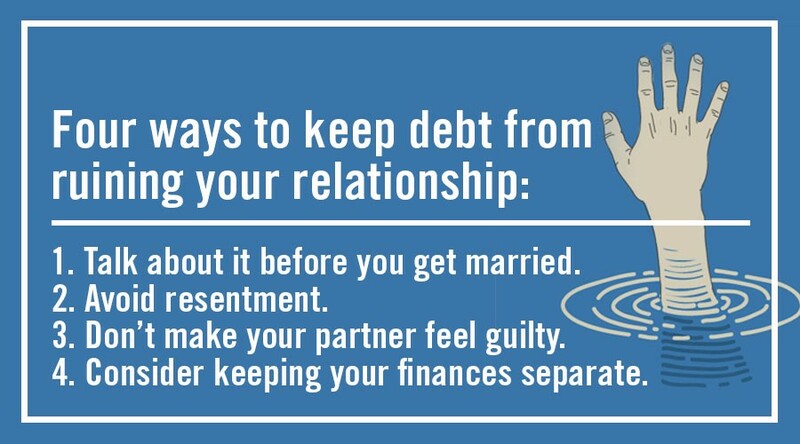 But the experience of marrying someone with loads of debt and having that debt weigh heavily on their relationship is a common one — a situation that causes guilt and resentment in equal parts and, if left unaddressed, can ruin a relationship. It’s far harder to deal with debt if the reveal comes after you’ve tied the knot. The deceit alone is enough to kill a relationship, says Carbonaro, now a financial adviser at United Capital and author of The Money Queen’s Guide: For Women Who Want to Build Wealth and Banish Fear. She suggests couples in this position seek marriage counseling (and that’s even before trying to reconcile any underlying money management differences). Preferably, the indebted party initiates this conversation, says Oakland University professor Terri Orbuch, author of 5 Simple Steps to Take Your Marriage From Good to Great. “The partner who is finding out about the other’s debt should feel free to ask questions, recognize whether it was a one-time situation or a general approach to money, and if their partner is trying to fix the situation,” Orbuch advises. The responses will indicate if the couple can effectively manage the debt together, or if their approaches to money are irreconcilable. After all, the single most important component of a successful, long-term relationship is having similar attitudes when it comes to money and finances, she adds. Benjamin Van Loon, a 31-year-old PR professional in Chicago, learned about his wife’s $100,000 student debt load when they were still just college sweethearts. He briefly considered breaking up with over it, but the thought of losing her “terrified” him. After several frank discussions (and some fights), they resolved to work through it together, he says. They’re still married, and to date have paid off $80,000 of her (their) debt. Key to dealing with a partner with loads of debt is learning how to avoid resenting them for the financial strain they’ve placed you on your relationship — and this can occur regardless of when the debt’s disclosed. “Don,” a 31-year-old Kansas City resident, married a woman with nearly $130,000 in debt, most of it student loans from her undergraduate and master’s studies. Don’s wife didn’t spring this news on him after they tied the knot; she disclosed her massive debt load six months into their relationship, “after we got pretty serious,” Don says. But the revelation was still shocking. Don needed to know his girlfriend was capable of sticking to a budget before the relationship could develop further. “I never doubted she was the right person for me. But if she couldn’t commit to paying her debts …” he says, trailing off. Sure enough, he helped her craft a budget and she stuck to it. They married two and half years ago, and have paid off nearly $100,00 worth of her debt. He estimates it will take a few more years of frugal living to pay off the rest. A week after their honeymoon, Don wrote his wife a $4,000 check to help her pay off a lingering credit card balance, and she felt ashamed. “I had never even thought of being in her situation, accepting thousands of dollars that you don’t feel you earned, to pay down your debt,” he says. Much like his resentment, her guilt has gradually faded with time. Carrie, a 35-year-old Cleveland resident, had $35,000 in debt when she met her husband in 2010. “I was in a financial hole that I could not dig out of.” Meanwhile, he had a “trivial” amount of student loan debt and a well-paying job. She told him about her debt about two months into the relationship, and they moved in together 10 months after that. He helped her pay down her debts, paying “more than his fair share” in expenses and teaching her better financial skills. They married after four years living together, but she still feels guilty. Some couples try to manage a debt disparity by keeping their finances separate. Two years ago, “Jason,” a 38-year-old San Diego resident, was engaged to a woman who was more than $40,000 in credit card debt — a not-insurmountable amount, but “she couldn’t find the motivation” to start paying it down, he says. And Jason had no interest in combining their finances and taking on her liability himself, especially considering it was due to frivolous spending, and not student loans. “It was a point of contention between us,” Jason says. “I made it clear that I didn’t want to lose my home because of her debt.” She never addressed her debt, but the problem took care of itself when Jason’s fiancée went to visit her ailing mother back in North Carolina and never came back. Not that keeping your money separate can’t work; Orbuch says it’s manageable as long as both parties are clear about how their money is divided. But all people with an indebted spouse need to know they’re going to be taking on an added responsibility, if not financially, then at least emotionally.